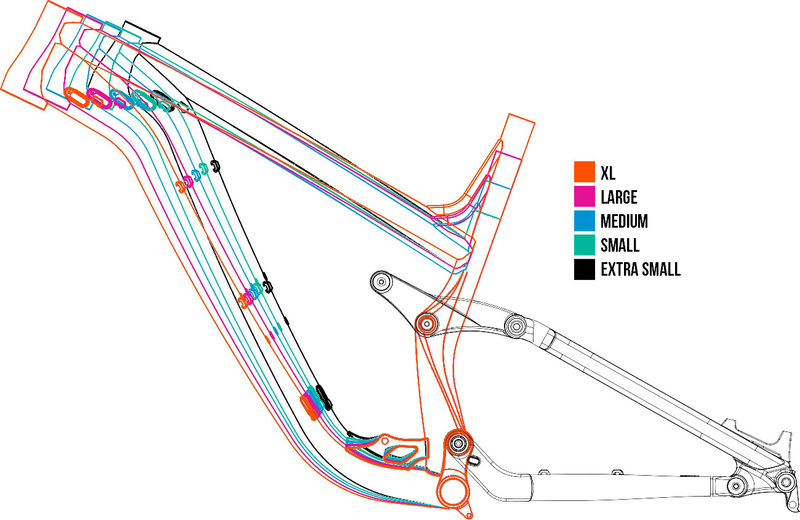 At Transition Bikes our geometry is not based around gender but rather a wide selection of sizing that will be ideal for almost any sized human. We design all our bikes to be very low slung so that no matter how long or short your legs are you can find the bike that has the proper reach for your arm and torso length and then let the seatpost do the work to size the height of the bike for pedaling. The days of selecting a bike size based on the seattube length is over. With the huge variety of trail styles, riding styles and bike setup preferences, we would urge you to look beyond your height and inseam to find the right bike size. We want you to have as much fun as possible riding your bike. And in the end we want you to remember, there is no right or wrong size for you (within reason of course). We highly recommend using the "Reach" measurement as the starting point for picking a size frame. The reach measurement will tell you how roomy the bike will feel when you are in an attack position standing on the pedals. Reach is now a standard that the mountain bike industry uses so you can use it to compare other bikes. Take a look at the style of trails you will be riding, and how you would approach them... are they fast and open or tight and technical? Steep or mellow? Do you like to catch air or keep the wheels on the ground? Do you pick the gnarly straight line, or move your bike around on the trail? Did you grow up racing BMX bikes, start off with mountain biking, or get into it from road biking? Want your bike to feel super stable or super agile? All of these factors come into play, and each one is just as important as the others, especially if you are in between sizes are trying to decide to either size down or up. Our new SBG Geometry is best optimized with a 40mm so it is best to think of what size you should get based on that stem length instead of the idea of sizing down and going with a longer stem or sizing up and going with a shorter stem. In order to reflect those choices, we have updated our sizing chart with a lot more overlap across the size range, and the inclusion of Extra Small in some models. We have tried to illustrate the bike sizes we felt would apply to each rider size; but be sure to look at the geometry and make sure the size you are choosing makes sense for your preferences. Everyone is different, plain and simple. The lines have become blurred and there is no strict rule of thumb anymore. When choosing your perfect size, ask yourself these questions, call or email us if you need a second opinion and most importantly... make sure you pick the setup that you feel will be the most fun!